Ever been in that state of mind where it seems like nothing can slow you down? Maybe it was in a sport where everything seemed to "click". You couldn't miss a shot, you knew what was going to happen before it happened and your reacted without a conscious thought. It might have been at work or on any project where it didn't seem like work and thoughts and ideas flowed effortlessly from your mind and everything seemed natural. This is called the state of "flow" or being in the "zone". In the book Rise of Superman, Steven Kotler dives deep into this state of flow and discusses where it comes from, how it might be achieved and how some of the greatest human feats every wouldn't have been possible without achieving this flow state. These flow states occur with a coupling of brain waves, theta and at point of "aha" gamma waves. 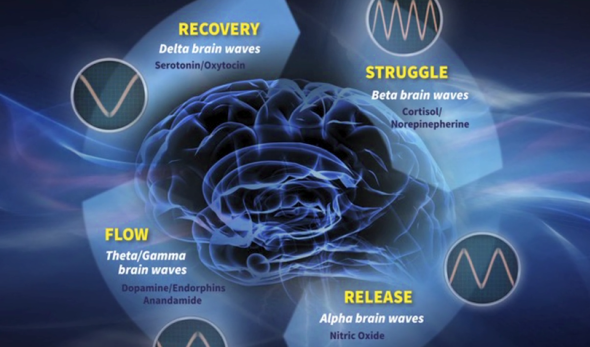 There are many ways you might be able to achieve these brain waves and reach a state of flow. Mediation is one and is talked about consistently from the bio-hackers and Mr. Dave Asprey. Mr. Asprey also discusses the use of gamma wave generating machines that you actually attach to the side of your head to help your brain achieve a flow state more easily. In the book Rise of Superman they look at mainly action sports athletes and the amazing things they accomplish such as jumping the great wall of China on a skateboard not once but six times (5 with throwing in a 360) which is impressive enough but what is even more amazing is that the last five times were done with a broken leg, swollen ankle and a torn ACL. The man completing these jumps felt none of that pain and was so intently focused on the task at hand that he just reacted and didn't feel the pain. This state of "flow" is a tremendous tool and could be very important in improving your ability to work better and achieve more but it is not always easy to enter and is extremely easy to lose. It can take you a minimum of 15 minutes to try and regain if it is even possible at all. This was a very interesting read and if you're looking to try and optimize some performance it is worth checking out (see links above and in side-bar).